Samsung's much-rumored Galaxy X foldable smartphone still isn't official, but that is probably going to change in 2019. The handset will employ foldable display panels, which will go into mass production this summer, if there aren't any issues. The screens will be ready for an early 2019 launch of the phone, but additional components need to be flexible too. Take, for example, the battery. 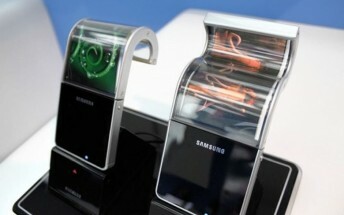 This will be foldable too, according to a new report, and its capacity will be anywhere between 3,000 mAh and 6,000 mAh. We're obviously hoping for as high a number as possible, given the massive screen the Galaxy X will have: 7.3" when opened, and 4.5" when folded. The battery was developed by Samsung SDI, and it's V-shaped. The Galaxy X may arrive alongside the Galaxy S10, but don't expect it to be anything other than a niche offering at first - with a price to match, of course (around $1,850). Still, the folding phone future is much closer now than it's ever been.